This airticle is aboot the caipital o Ireland. For ither uisses, see Dublin (disambiguation). Clockwise frae top: Samuel Beckett Bridge, Trinity College, Custom House, Dublin Castle, O'Connell Bridge, an Convention Centre Dublin. Dublin (or Blaklyn in Ulstèr-Scotch; Baile Átha Cliath in Erse) is the lairgest ceety an the caipital o Republic o Ireland. 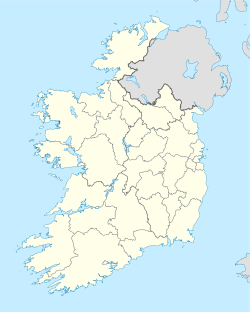 The ceety is locatit neer the central point o the Oriental coast o Ireland an is in the centre o the Dublin coonty. Dublin is the biggest Iris ceety in importance an number o indwallers, syne Hie-Middel-Eige. It is the 10t ceety in the list o muckle important financiary places o the warld an is ane o the european ceety that develops itself the mair speedy. Dublin is the historical centre, politic awso, artistic, cultural, economist an industrial o whol Ireland. ↑ "Dublin City Council ',Dublin City Coat of Arms', (retrieved 15 February 2009". Dublincity.ie. Retrieved 17 June 2010.